Thought you learned a lot in all those history classes? 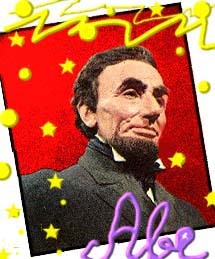 The dates of the Civil War, insights into Nixon's relationship with China, blah blah blah. Fine. But do you really know your history makers? Can you comprehend how these men and women made young hearts swoon? Why their rhetoric and deeds led to fruitless crushes and 8x10 posters in high school lockers? We here at OOZE, in the continuing quest for journalistic integrity, dug up a huge, moldy stack of periodicals from a time long past (even going to microfiche for some of the Old Testament stuff) in order to find out just how- HOT -these newsmakers were in their day. You'll be surprised at the data we dug up. FAVORITE BOOK: Benjamin Franklin's "Private Parts"
WHAT WE MIGHT FIND IN HIS WALLET: Four score and twenty condoms. WISH FOR THE FUTURE: "Shave beard, grow mustache, don eyeglasses and record song parody of 'Star Spangled Banner' entitled 'Star Spangled Banana'". CURRENT HEARTTHROB RATING: Somewhere between Corey Feldman and Professor Irwin Corey. RECURRING DREAM: I'm sliding down a "a pink waterfall and chosen to save mankind from sin. Then I turn into a giant waffle and float over Yankee Stadium." OPINIONS OF HIM IN HIS DAY: "He and his Father are both hunky!" (Tiger Beat), "
FAVORITE BOOK: "Men Are From New Hampshire, Women Are From Delaware"
WHAT WE MIGHT FIND IN HIS WALLET: Incriminating Polaroids of Faranelli and a donkey. CURRENT HEARTTHROB RATING: Comparable to Macaulay Culkin, if he still had a career. HER IDEA OF A PERFECT DATE: While sharing sodas at the maltshop, she and her date have a religious epiphany encouraging them to slay Muslims together. HIS IDEA OF A PERFECT DATE: Mutual confession on leather couches followed by a midnight touching of the beard. FAVORITE SONG: "Obsession" , "Animotion"
HER IDEA OF A PERFECT DATE: Sitting still for days, weeks, and months on end. WISH FOR THE FUTURE: If DaVinci would invent some eye drops to fix that annoying stare. HIS IDEA OF A PERFECT DATE: Cruise along the Nile in a barge, throwing empty beer cans at his slaves. FAVORITE SONG: N/A; but "would like to kill that Steve Martin guy"
CURRENT HEARTTHROB RATING: John F. Kennedy, Jr., anyone?